Hip-hop unit HEADS, made up of two fifth-grade and two sixth-grade boys from Osaka, are in the spotlight after two years of weekend performances on busy streets in Osaka's Kyobashi and Tokyo's Shibuya, shopping and amusement districts that draw many young people. Passers-by who stop and watch them might say, "Hey, they're just kids." But they soon add, "But they're good !" The kid rappers breakdance to music they select on their own, and choreograph the dances themselves, with sixth-grader Takuya Makihara, the group's leader, as coordinator. After performances, they hand out handbills telling who they are, and carry their musical instruments and equipment by themselves. They are now so into rap and dancing that they practice after school late at night every day. "I sometimes have to do my homework while riding on the train home. But I don't wanna quit. I love it," said Ryota Kohama, a fifth grader, who has six years' experience of dancing. They all go to different public elementary schools in Osaka, western Japan. Since they got to know one another at a dance school, they formed the unit and have won first prize at several dance contests. 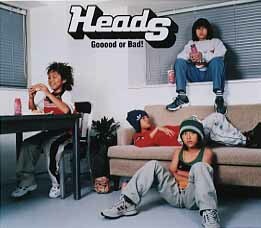 HEADS released their first CD, "screeeem! ", in July 2000, and their second, "Gooood or Bad!" in November, produced by a popular musician. After one TV station featured the group on a news program, fan mail increased, and now many people call out to them when they go out for street performances. "Watching you trying so hard gave me courage," a junior high student wrote to them. An elementary school teacher told them he wants his class to "learn from HEADS how to aim high and reach out to realize their dreams." "I feel very bad when not so many people stop and listen to us on the streets. I now understand that they don't pay attention to us when we're down, out of spirit," said Toru Yamashita, another sixth grader. Ryota envisions the 21st century as a period when there is nobody who doesn't know HEADS. Toru, for his part, wants to do everything possible, including a one-man live performance and writing the words for rap music. Their great potential and single-minded pursuit of their dreams are inspiring up many people. But shy Kohei Nakamura, a fifth grader, said, "The most important things to me are my family, friends, and HEADS." His three partners all nodded their heads in agreement.